Show your merchandise in style! Our popular Full Vision Display Case featuring durable melamine laminate black exterior finish will help create an attractive display presentation, while matching almost any store fixture on your showroom floor. 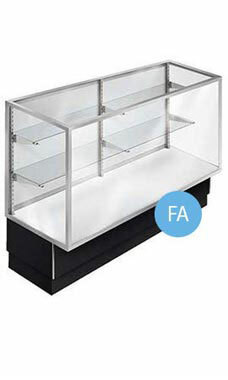 Featuring a glass front, top, and sides with two rows of adjustable 1/4" split glass shelves, it's easy to highlight your fine products for all to see. Shelves measure 8" deep on the top row and 10" deep on the bottom shelf. Classic styling includes a white deck and rear sliding doors, steel standards, and brackets, a glass display area, and a satin finish clear anodized aluminum frame around. An optional lock and light kit are sold separately. This modern classic will give you years of affordable elegance and dependability! Crating for secure shipping is included in the price of the display case. Overall size measures 38"H x 20"D x 70"L. Ready to ship.